Nothing gets your home into the holiday spirit like a beautifully trimmed Christmas tree placed as the centerpiece in your well-decorated home. A sturdy tree stand is vital for keeping your Christmas tree well-watered and standing strong throughout the season. The right stand is also one that will blend with the rest of your holiday decor and add to the tree’s appearance. Rocky Mo untain Cabin Decor’s Christmas tree stands are as attractive as they are sturdy and easy to use. Our stands feature commercial-grade, solid steel construction for ultimate strenght and support. These stands are adjustable, and available in a variety of sizes, so you can easily make sure you have a stand that will fit your tree comfortably and securely. One of the biggest nuisances of having a live Christmas tree is making sure it stays well-watered. With the auto-stop watering system included with each of our tree stands, you’ll have no trouble watering your tree and keeping it healthy and beautiful all through the holiday season. Our solid-steel construction Christmas tree stands are built for a lifetime, not for a landfill! Our heavy-duty Deluxe Christmas Tree Stand features outrigger leg attachments. With these unique leg extensions, this stand can accommodate a Christmas tree up to 12 feet tall with an 8 inch maximum diameter trunk. This stand comes with a patented “Circle Piece” center system, which attaches to the tree before placing it into the stand. This assures your tree is perfectly centered and secure in the stand. You can easily rotate the tree inside the stand to find its optimal branch position before locking it down. Simple to use, quick set-up and a perfectly straight tree every time! Stand Features: Solid North American steel construction Patented weight absorbing base design Impact grade leak/rust proof plastic liner High quality baked on powder coat finish Four heavy duty steel (3/8) eyebolts Vertically adjustable support arms Anti-scratch floor pads 2 gallon water capacity Weight: 30 pounds LIFETIME WARRANTY! 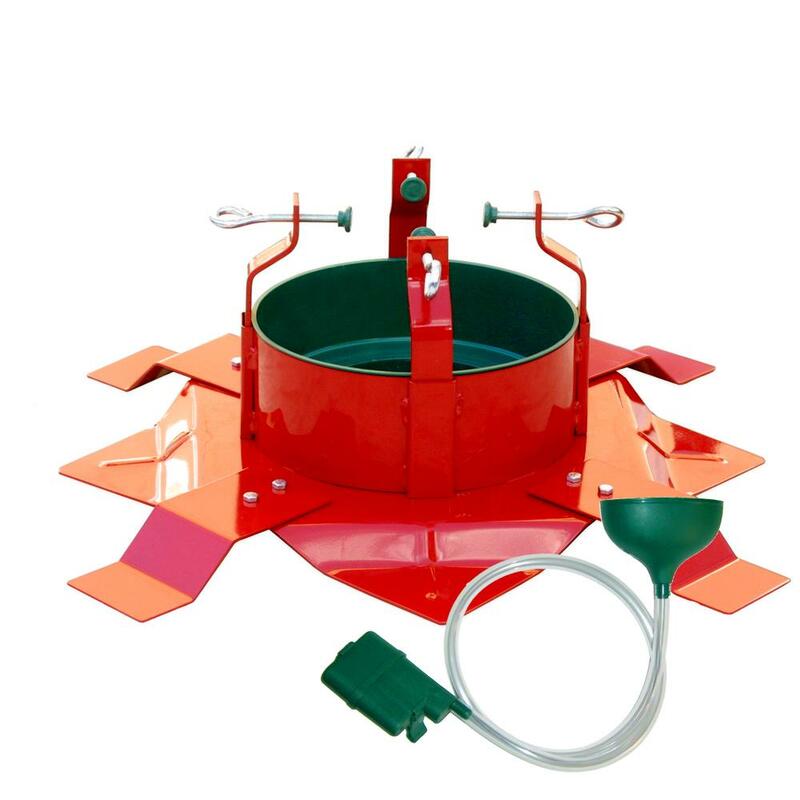 In addition, your stand will arrive with our famous Auto-Stop Watering System. No more climbing under your Christmas tree! In seconds this unique watering system attaches to your stand and tree. Enjoy the convenience of watering at hip level and never over filling your Christmas tree stands water capacity. To see all our Christmas Tree Stands click here.